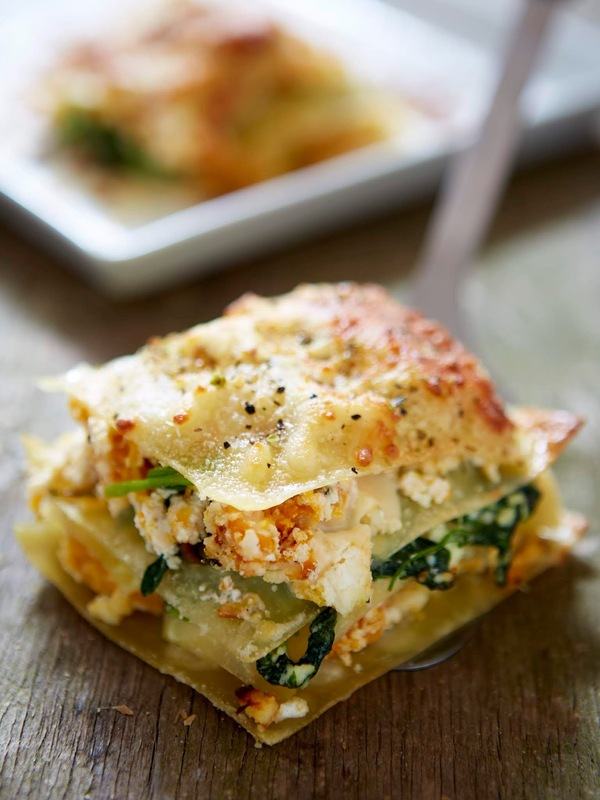 A fresh twist on traditional lasagne. 2. Put oil in a large roasting tin and add the butternut, onion and one tablespoon of water. Toss everything together and season well. Roast for 25 minutes, tossing halfway through. 3. To make the white sauce, put the butter, flour and milk in a small pan and bring slowly to the boil, whisking constantly. Reduce the heat to a simmer and cook for five minutes or until the white sauce has thickened slightly. 4. Put one tablespoon water in the bottom of a pan and heat. Add the spinach, cover and cook until the leaves are just wilted. Alternatively, pierce the bag and heat in the microwave for one to two minutes. 5. Add the ricotta and grated nutmeg to the white sauce and season well to taste with salt and freshly ground black pepper. Mix well. 6. Layer the lasagne in a dish, starting with the butternut and onion mixture, then the spinach, the lasagne and the cheese sauce, seasoning as you go. Sprinkle the grated cheese on top. 7. Cook in the oven at the same temperature for 30-35 minutes or until the cheese is golden on top.